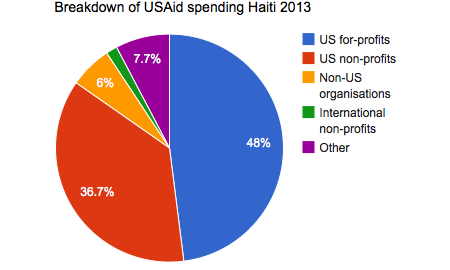 American companies and NGOs continue to receive the lion’s share of US aid funding for projects in Haiti four years after the earthquake that levelled the capital Port-au-Prince, despite US government promises to spend more money through local organisations. 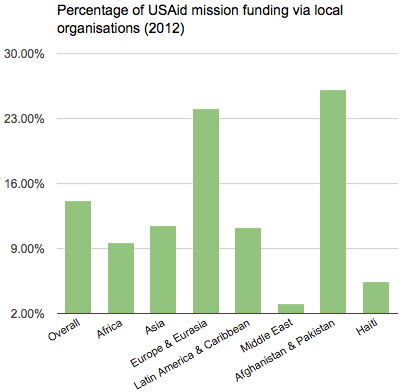 Critics have argued for years that donors’ practice of spending aid money through organisations located in their own countries has hampered efforts to build self-sufficiency abroad, and works to the detriment of local businesses and industries. Vijaya Ramachandran, senior fellow at the Center for Global Development thinktank in Washington, said working more closely with Haitian organisations could help to bolster the country’s long-term development prospects. “As the effort shifts from relief to recovery there’s a lot more you could be doing with local organisations,” she said. In 2011, USAid administrator Rajiv Shah warned that the aid industry “is full of incentives designed to prolong our efforts rather than reduce them or enable transitions” and said his agency would no longer be satisfied with “writing big cheques to big contractors and calling it development”. Later that year, dozens of America’s largest international development contractors banded together to form the Council of International Development Companies (CIDC) to serve as a unified, public voice for private development contractors on Capitol Hill. CIDC has questioned USAid’s target for local spending and says its members help to transfer technical expertise by hiring and mentoring local staff.